I have a dream. Have had it for some time. The dream is about combining image and sound. Not, as you’d expect, about setting up a dream home theater system for watching movies. Film music/sounds deserve serious consideration (not least because so many contemporary commercial movies belittle spectators’ reception capacity in this respect), but that’s not my concern today. My dream is about doing what art museums sometimes do in their skillfully illuminated spacious white exhibition halls: put on display a painting, or a video work, and then complement and compliment it with appropriate music and do this all at home. In practice the task would be to download a selected work or works onto the TV screen or canvas/wall, and then source suitable music for it, either a sample of music per one piece of art, or in the form of a slide show. The main focus is on finding music that would go with the rhythm and dynamics of the chosen art work or support some other such association. I don’t remember having seen a single cool Hi-Fi system that would have a TV screen in the middle. It may work for some audiophile hermits or when the space is notably scarce, but as a standard solution, No. Fine. So what should I do to make my dream come true? Raise the TV screen on top of my Hi-Fi rack and in between my hifi-loudspeakers? I don’t think so! I don’t remember having seen a single cool Hi-Fi system that would have a TV screen in the middle. It may work for some audiophile hermits or when the space is notably scarce (as it often is, in certain countries more than in others, so there’s no need to be arrogant here), but as a standard solution, I think, it would serve neither Hi-Fi listening nor TV watching, let alone some more ambitious aims. Thus, at least for me, that’s clearly not how to proceed. Hang the TV and flat speakers on the wall? There are some rather nice looking & good sounding on-wall loudspeakers around, but to make them hanging (with fasteners and rails) is an effort of its own, and would not save one from the trouble of finding proper electronics and a shelf or board for it. What I’d need, and I guess ordinary TV/film watching and music streaming people alike, is the TV against a pure and clean background, a simple platform for carrying the screen and taking responsibility of the sound reproduction. Voila, Artome Cinema sideboards! 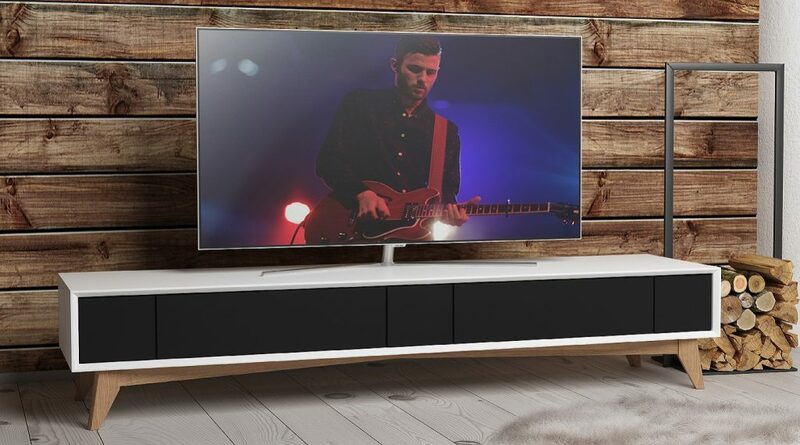 The Cinema is a good-looking plug-and-play TV stand designed to make life a little easier while delivering decent sound from the TV set it supports. Artome’s roots extend back to 2005 when the company called Murea was founded. Murea’s mission is to create comfortable environments and spaces that produce positive experiences and enjoyment to people inside, be it a classroom or a hotel lobby, a nightclub or a church. AV technology, IT and professional furniture design, that’s the formula. 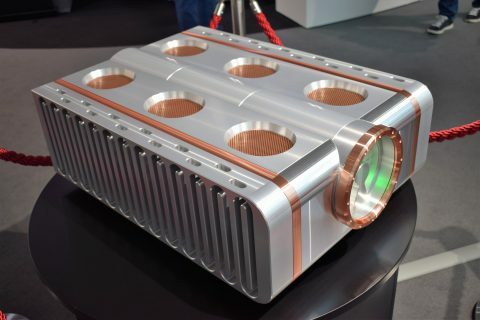 For a short period of time Murea tried its hand at speaker manufacturing, but to keep things simpler and more transparent, to make the operation run more smoothly and economically more reasonably, speaker manufacturing was handed over to a new company named Artome. ”If Murea is all about integration of AV technology, lights etc. 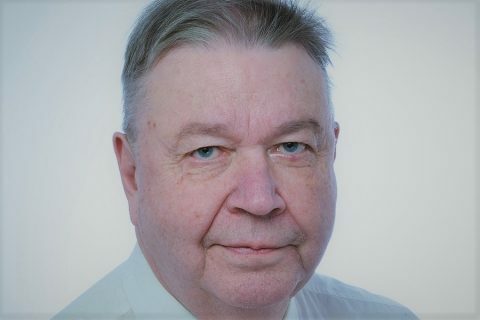 to create feel-good spaces, Artome is about manufacturing smart furniture, in which AV technology is merged into the furniture so as to eliminate cabling, installation of AV systems etc.”, clarifies Artome’s founder and CCO Toni Parikka the difference. He repeats the story of how his good friend once asked him to build a piece of furniture with in-built speakers and a sound system ”hidden from the eye”. 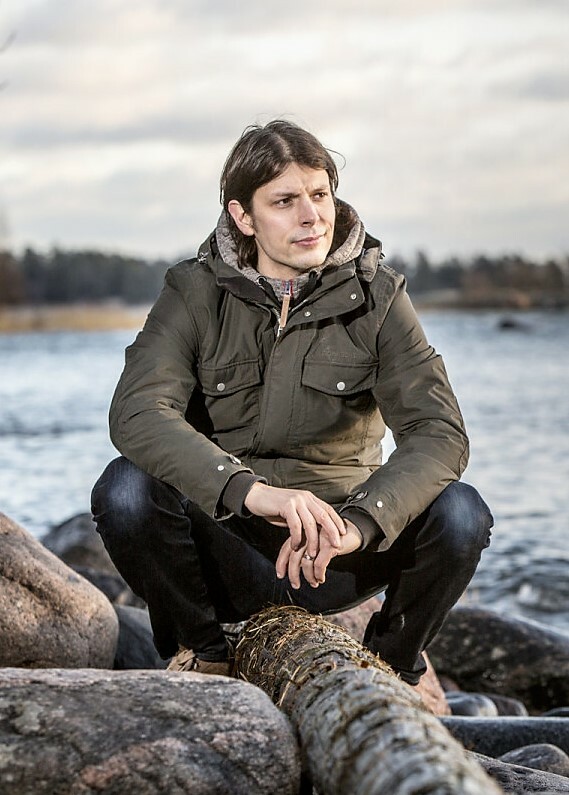 Being an engineer himself Parikka immediately realized that the project would require a complete rethinking and redesign of the furniture, taking into account the fundaments of acoustics ”in order not to ruin the sound”. Had it been just a friend and his whim, Parikka hardly would have needed to bother his head with the basics of bringing audio into the furniture. But, of course, the significant commercial potential of the idea didn’t go unnoticed by him: his friend’s wish was more or less universal! 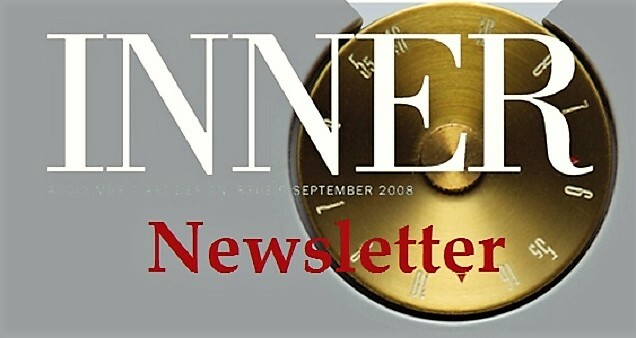 As I see it, Artome’s true perception, the deep fundamental idea, is that apart from a sect of HiFi nuts and the like, whose number is limited anyway, ordinary people are looking for a “hidden experience”, and that the strive for such hidden experience is deeply rooted in the human condition, reflecting how people at large wish to experience technology. It is often said that technology does not have a history in the normal sense, because technology is just an instrument in some use. Once stripped down from that use (eg. when technology gets old), technology hardly means anything at all. Only such things can have history in a proper sense that have some value irrespectively of the value they have as a means to some end. If technology has a meaning at all, it has it only with respect to the future, not to the past. When a technical device functions properly, as it’s planned to work, it makes itself invisible. The better it works the less it exists, and the less it shows itself to the user. Technology is a negative creature, as a philosopher put it. So, as long as it (technology) works, it can be forgotten, and when it doesn’t work, abandoned. That is precisely what ”normal” people do (women more often than men): they ignore the technology. Technology surrounds us in every possible way but who really consciously make technology as the object of his or her thinking? Why should one? 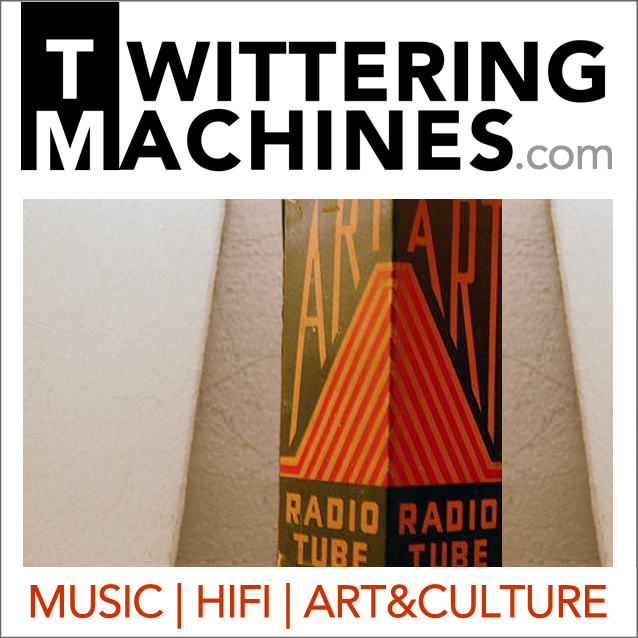 Apart from engineers and audiophiles, who would really care of how a technical device or systems actually work? Who honestly understands about technology anything at all? Artome, naturally, doesn’t phrase its intentions and design philosophy in these terms. But the concept of the hidden experience is at the heart of their operation, and that makes them one of the rare audio companies that seriously consider ordinary people’s fully justified wish to dismiss technology. The concept of the hidden experience is at the heart of their operation, and that makes them one of the rare audio companies that seriously consider ordinary people’s fully justified wish to dismiss technology. In every third sentence or so I hear Parikka referring to ”our customers” by which I understand he means normal people who are fed up with cable fuss and intrusive AV/HiFi equipment in the living room, people ”who’re just looking for a quality sound from their TV set with no extra visible objects and devices”. It’s that simple. One just needs to respect the fact. So here’s the narrative: TV screens are getting not only bigger but thinner as well leaving no possibility to install high quality audio system internally. Period. Hence, the need for adding active or passive loudspeakers plus some electronics in front of them. 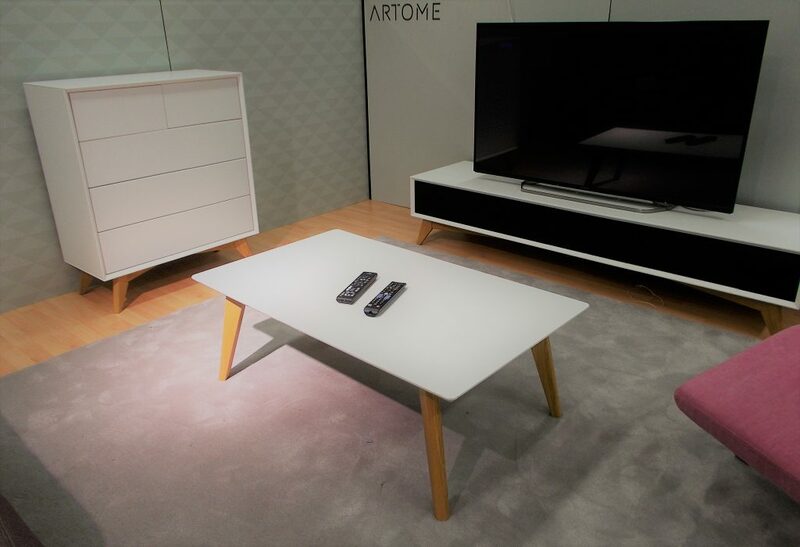 Artome’s Cinema Smart Furniture goes against this current. 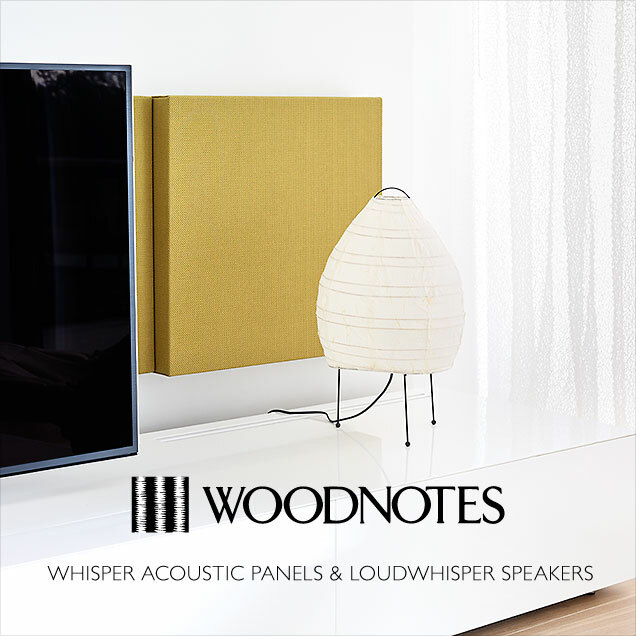 It pursues to offer ”incredible sound quality” without the room being filled with ”bulky speakers and unsightly wires”. After the operation, the home both sounds and looks great, they say. Let’s look at the looks-part first. 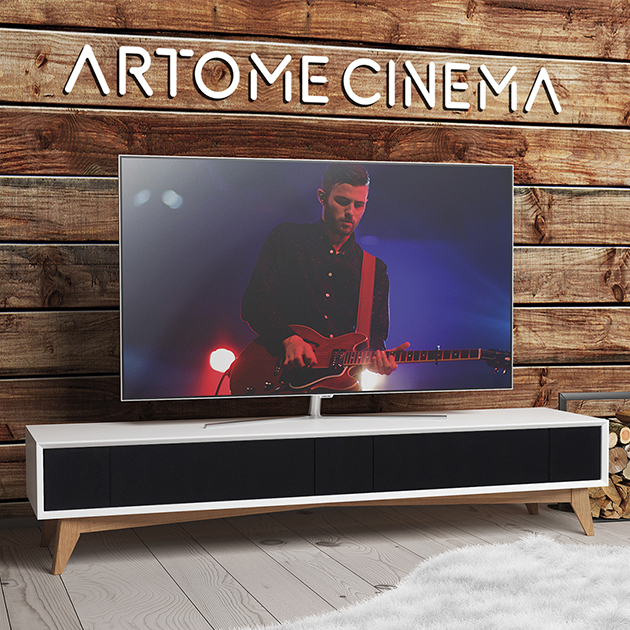 The Artome Cinema sideboards with a built-in sound system comes in two speaker configurations: the 150 cm wide Cinema 2.1 for stereo sound; and the 183 cm Cinema 3.1 for home theater experience (can be used for stereo playback as well). Both are available in two styles: Vino or Serene. There are certain design differences between the two but the most visible difference is the legs: the Vino series features legs that are circa 45 degree angled and made of solid oak, whereas the Serene’s legs are straight metal. Neither design is particularly radical or pioneering, and that perfectly fits the overall scheme of things. With the Cinema sideboards Artome’s not addressing the pursuers of speciality but ordinary pragmatic people. 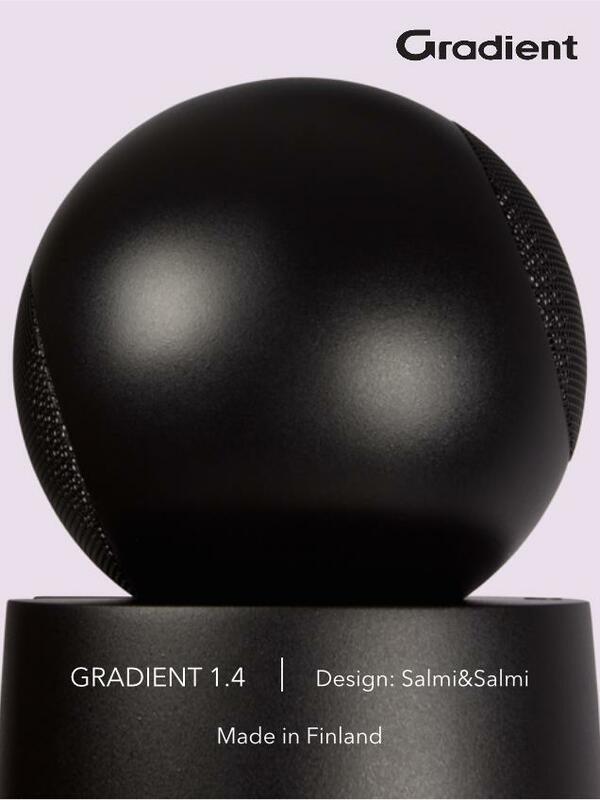 As far as I can tell, with their not too fancy yet elegant designs Artome shows it has a pretty accurate eye on its customers’ aesthetic preferences. As to the integrated technology, the Cinema 2.1 comprises two (stereo main) loudspeakers and an active subwoofer. The Vino Cinema 3.1 tops that with the center channel speaker for multi-way programme material. The speakers literally share the walls with the furniture. The front firing drivers are 5 inch coaxial full-range units with the second (whizzer) cone for the tweeter crossed at 4000 Hz. The drivers are fastened to a sealed 6L enclosure. Because the stands are 35 cm (Serene) and 40 cm (Vino) high, the front panel of the speakers is tilted about 45 degrees upwards so as to better direct the sound towards the listener’s ears. Below 90Hz (the Fs. 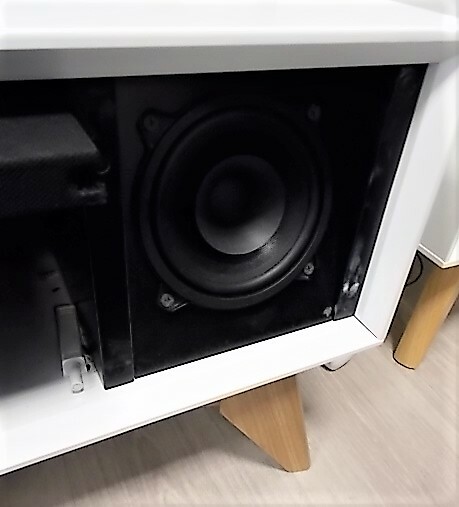 of the main driver is 81.3 Hz) there is a downward shooting subwoofer also directly integrated into the furniture’s structure. The 8” long-stroke woofer is in a 40 L ported cabinet, driven by a Hypex-amplifier supplied by the Aura Audio. Because the stands are 35 cm (Serene) and 40 cm (Vino) high, the front panel of the speakers is tilted about 45 degrees upwards so as to direct the sound better towards the listener’s ears. 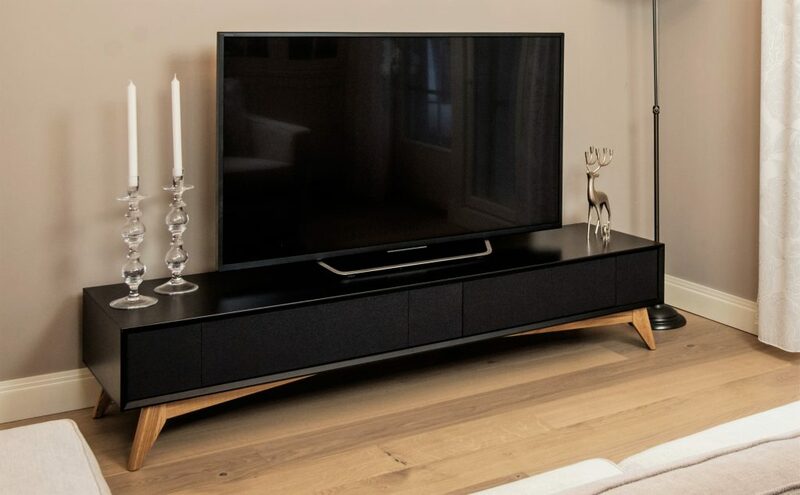 According to Artome, the frequency response of their sideboards, or soundboards if you like, is typically ±3 dB 50-20000Hz for the Cinema 2.1 and 40 – 20000 Hz for the Cinema 3.1. The sensitivity of the speaker system is 86dB/1m/1W, and the nominal impedance 8 ohms. But of course, those figures and specs in general are interesting only if the customer plans to change the amp that comes along: the 5 x 70W (6 ohm, 0,09% THD) Yamaha RX-V385 (or optionally MusicCast RX-V485, RX-V585 and RX-S602) with all the connections and specifications of the standard version. None of the technical info really matters to the potential user who, after connecting the TV to the amp with the included 2m HDMI cable (there’s an optical cable as well), and the power cord to the internal 3 socket power extension, just grabs his or her mobile device to get going and for controlling the audio system. That’s all. 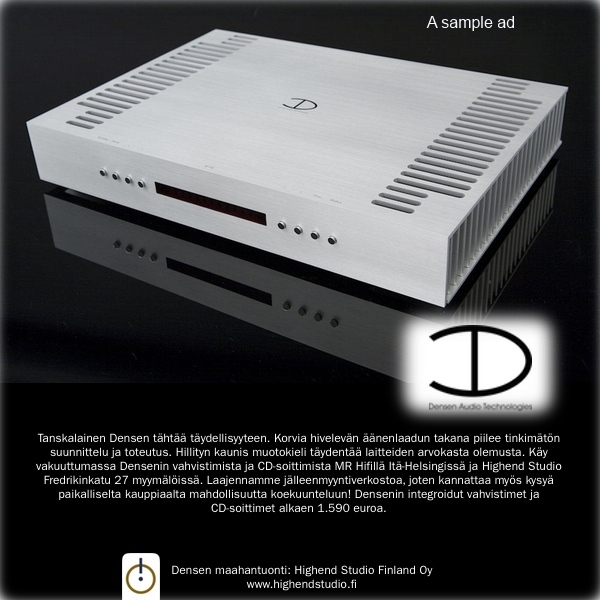 The integrated AV-amplifier is preset for the best sound by Artome and automatically connects to the device in use (the CEC standard) be it a mobile phone or tablet or laptop. The TV set, the Cinema stand and a stretch of power cord reaching the wall outlet are the only visible objects. If a remote feels more comfortable, one comes along as do the necessary cables for non-wireless connection. 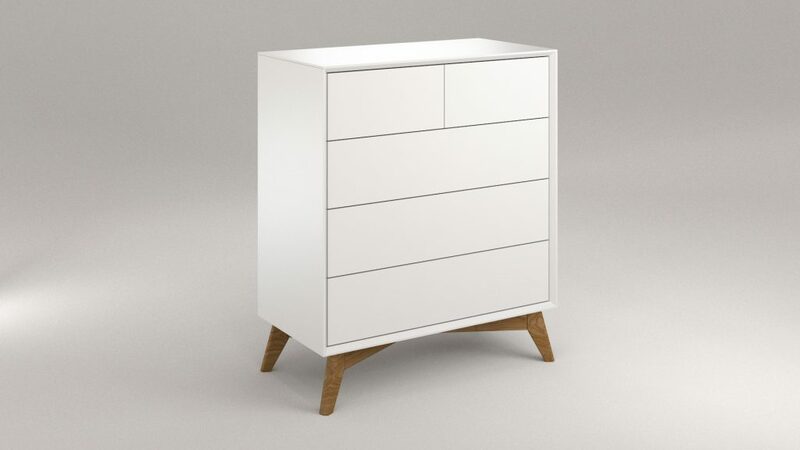 The Cinema TV-stands can also be purchased without any technology inside in which case half of the stand becomes a drawer, and the other half a storage space with a door. All the information packed in my head, and the 55” Smart TV on the Artome stand, I set out to fulfill my dream project. But prior that, I decided to test the Artome Cinema 3.1 as a stereo speaker system, and with the 3.1 video sound. The first test sample was most telling. The track I chose was the melancholic ”I don’t know” from Paul McCartney’s latest Egypt Station album. Having heard the song several times before from various sources I immediately sensed that something about the sound was clearly not right: the directionality was wrong, and the sound in general was inconsistent and undetermined, not smooth at the bass etc. Not good at all. It turned out to be the sound of the TV itself (apparently the AV receiver had got tired for waiting and had shut down itself or something)! Adding the amp to the chain and taking the Cinema’s speakers on board, made the whole sonic picture, tonally and image-wise, a way more plausible. Non-linearities and inconsistencies largely disappeared. That is, the Cinema 3.1 improved the sound exactly in those areas where the TV set mostly needed help. There are some flat Smart TVs on the market that in the shop may impress by their rather healthy sound quality but when one gets the chance to compare the TV’s own sound to the sound of a proper audio system such as the one hidden in the Cinemas, the TV sound’s defectiveness becomes soon obvious. The verdict? The Cinema 3.1 did what it was designed to do! Adding the amp to the chain and taking the Cinema’s speakers on board, made the whole sonic picture, tonally and image wise, a way more plausible. Non-linearities and inconsistencies largely disappeared. 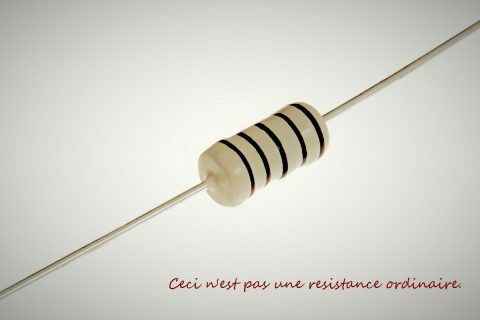 A proviso. 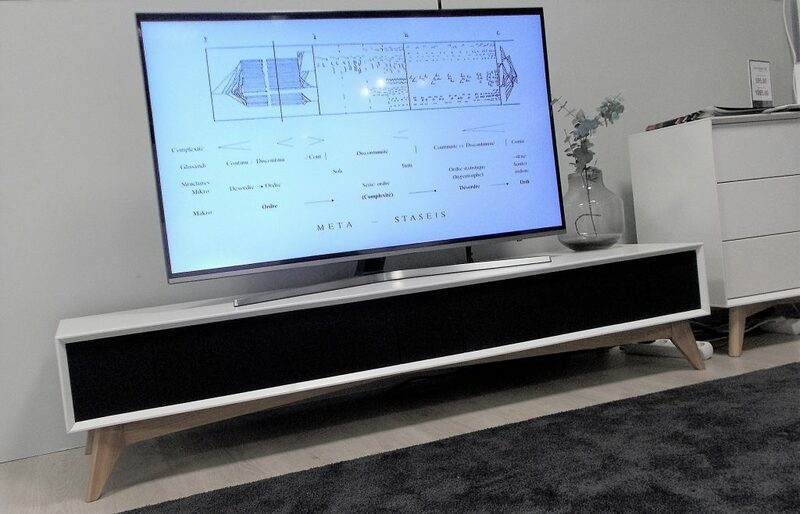 Since the distance between the main channel speakers (measured from the center of the drivers) is roughly 160cm, sitting at one corner of the stereo triangle (60 degrees) would bring the couch or chair too close to the TV screen resulting e.g. in lower than necessary image focus. The longer listening distance (30 to 40 degree listening angle vis a vis the speaker drivers) would compensate this and make the sound emanate more from the front of the listener. Plus, since the extra cone of the driver functions as a waveguide for the frequencies above 4000Hz, the longer distance also slightly changes the tonal balance by helping the ears to receive a little bit more of the direct HF contents of the sound, which I think would be beneficial in terms of the overall tonal balance. Having said that, the good news is that the Cinema didn’t sound particularly directional so that moving off the center of the sofa to the side didn’t make the sound particularly one-sided. An albumful of Haydn’s symphonies proved that the Cinema is able to bestow the sort of spatial performance (eg. extending the width and depth of the TV’s sound) prerequisite for such orchestral music. And note: without any artificial, digitally processed surround-extention of the standard soundbars (or the Yamaha’s Cinema DSP technology). Video? As far as I can judge, the sound track (3.1) of the Mad max II, for instance, with its adolescent sound effects, was reproduced quite believably, embracingly and immersively and powerfully, from the bottom to the highest frequencies. Speech reproduction? I didn’t make specific tests, but I didn’t detect the sort of tonal anomalies that could have harmed the speech sound (don’t forget that there’s some serious audio engineering behind the design). However, how the mid-upper bass and lower midrange blend with the rest of the sound depends eg. on where the stand is placed (eg. how near the wall behind). 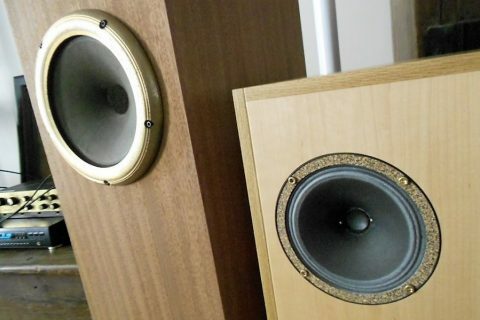 Although the Cinema/amp is pre-optimized to deliver best sound, it may be that some correction of the sound/bass will occasionally become necessary. The Yamaha’s amp sports all the features to do the control. Was the sound such that the Cinema could replace full-fledged surround systems of home theatre enthusiasts? I’m not an expert but I guess, No. As should be clear by now, we’re talking about two different, not comparable things here. The Cinema in the room one doesn’t even realize that there’s an audio system around. Nor will the Cinemas replace audiophiles’ sophisticated Hi-Fi systems with dedicated electronics, speakers and cables. 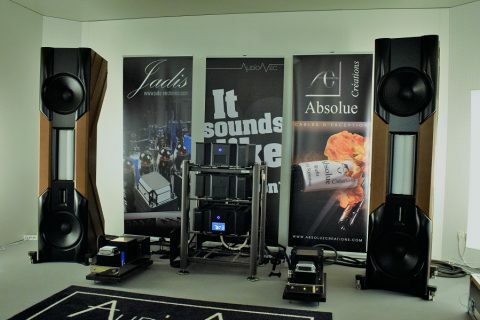 The sound is not in the same manner subtle, the speaker/amp combination is not fine-tuned to reveal every nuance of the instruments’ timbral structures, shed light on the furthest corner of the soundstage, and so on. 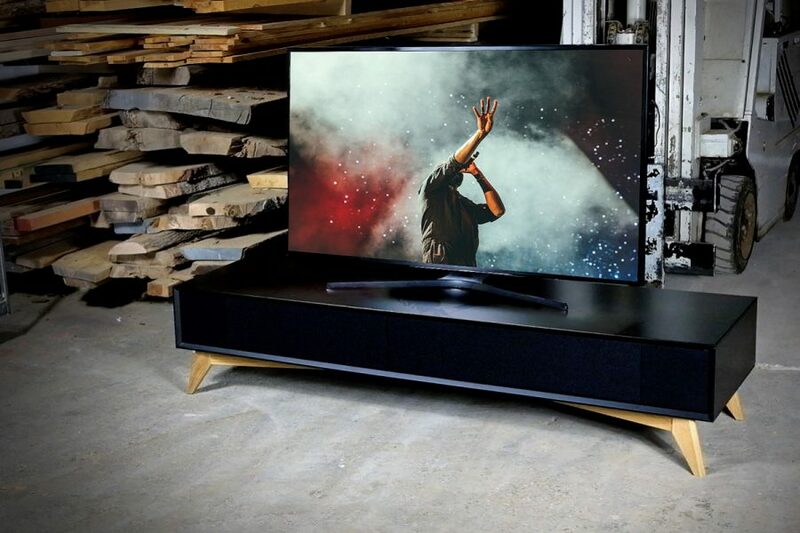 When it comes to the sound quality, the objective of the Artome Cinemas is first and foremost practical, not an aesthetic one: to add decency to the sound of the TV. They do. And they do it in the way that in all likelihood will satisfy 90 % of those looking for this kind of solution. Taken as a whole, the Cinema is a premium product with a premium sound. Right, so finally my project. 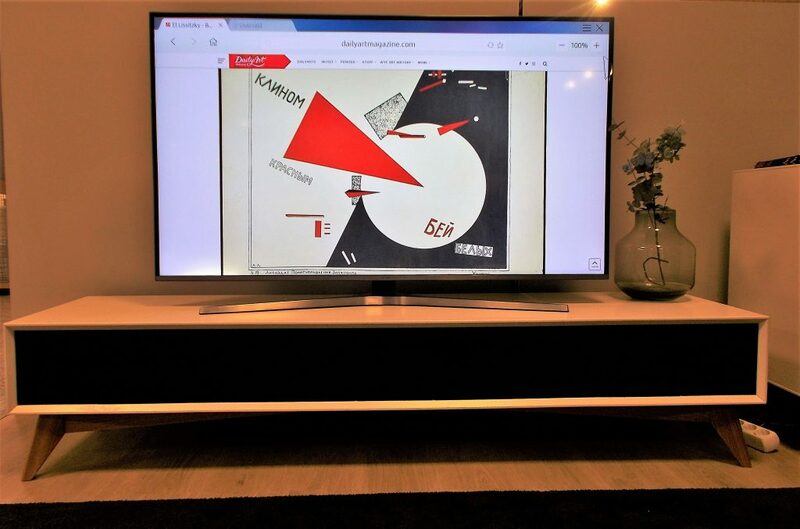 As an art work I decided to choose something by the Russian avant-gardist El Lissitzky (1890-1941). 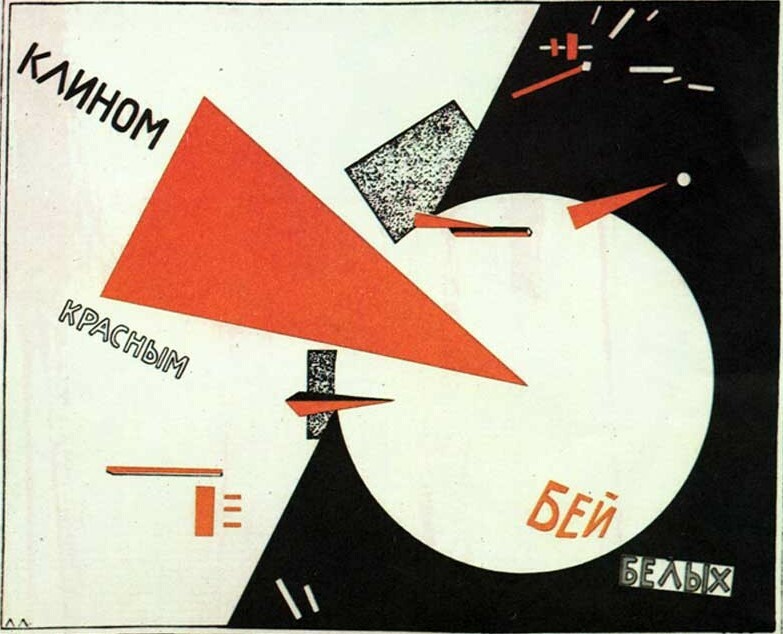 Lissitzky was an artist, designer, photographer, typographer, polemicist and architect. He was actively involved in developing suprematism with his fellow artist Kazimirh Malevich. Plus, his exhibition displays and architectal works are known to have influenced the Bauhaus and constructivist movements as well as the 20th century graphic design. 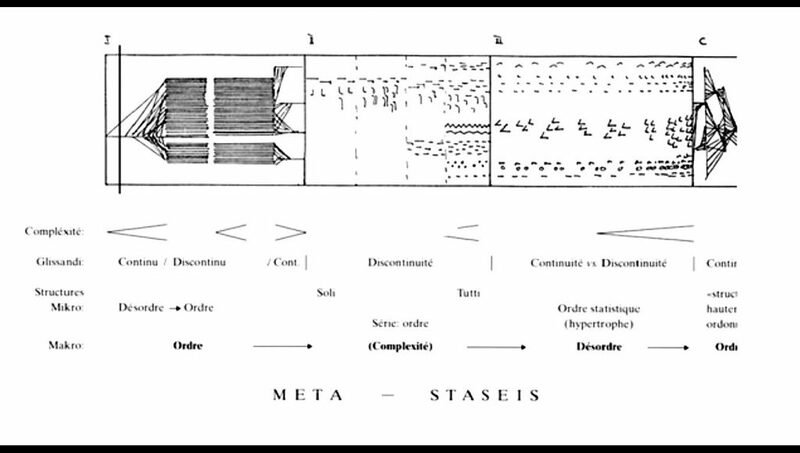 To companion Lissitzky, as for its musical equivalent, I picked up perhaps the most famous composition by the revolutionary composer, music theorist and engineer Iannis Xenakis’ (1922 – 2001): the ”Metastaseis” from 1953–54. It’s a piece for orchestra with independent parts (scores) for every 61 musician of the orchestra. Like Lissitzky, Xenakis was an architect, who not just used mathematical models (set theory, stochastic processes, game theory) in composing music but integrated music with architecture eg. by designing spaces for specific music compositions. 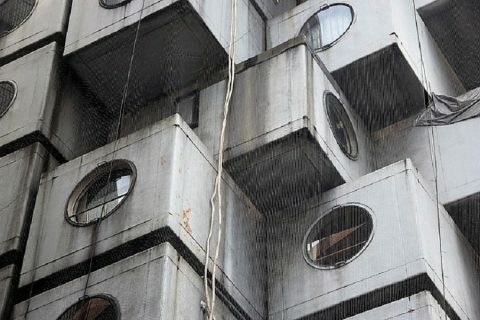 Thus, the loose link between the two would be their interest in architectural forms. So how did it go? Fine! It was fun. You should try it. Nothing’s easier. Just download an artwork from the net of your Smart TV, and choose music (Spotify, Tidal, youtube etc.) from your mobile/ipad to go with it, and let go! If you happen to find particularly happy combinations, let me know. While watching and listening, it occurred to me that what indeed would better follow the spirit of Artome’s design object than this project. Think of it. The whole exercise is about software (music/art), and not hardware (technology). The hardware is secondary. Since it was more like an art project rather than a cinematic one, the sound needed not be particularly 3D. The only demand for the audio system was that it would not intervene or interfere with the experience tonally or some other way. And it didn’t. The experiment made me focus on watching and listening, and thinking. The Cinema simply disappeared from the scene. Having enlightened me about the Cinemas, Parikka took me to another Artome product, in which audio electronics is embedded into smart furniture. It was a dresser from the their dresser collection (four different models). 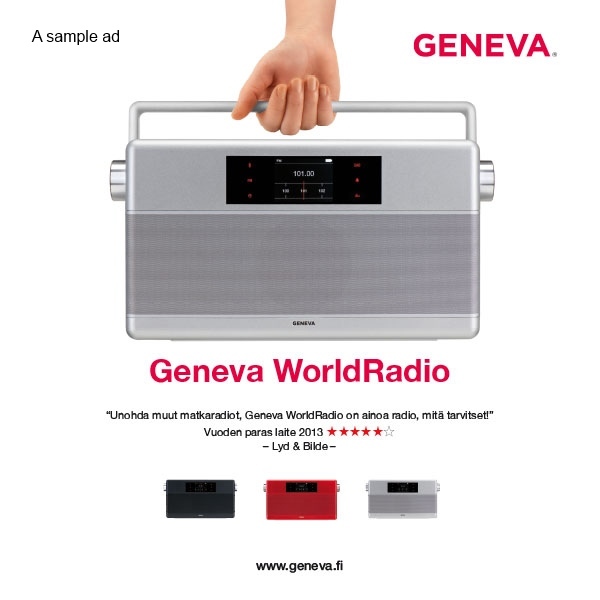 What makes it special is the drawer closest to the floor which is reshaped into a wireless (bluetooth) speaker. And in what way! Instead of using traditional dynamic speaker drivers, the 2-way system employs an Exciter module. The patent pending module is covered with a 2 mm layer of MDF. It is this Exciter/MDF unit that ‘vibrates’ and reproduces the sounds/frequencies above 500 Hz. For frequencies below 500Hz, a ported bass/mid unit kicks in at the bottom of the dresser. 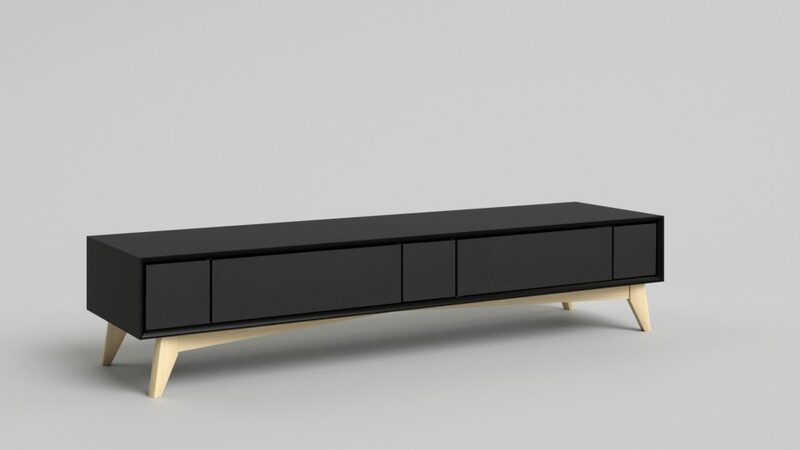 And as with the Cinema sideboards, the Vino dresser is connectable to any sound source available, wireless or with a wire. I wouldn’t perhaps go as far as stating that ”the sound quality will meet the needs of even the most demanding audiophile”, but I must say I was taken by a surprise how sensibly the vibrating drawer/dresser, or whatever that is, sounded. 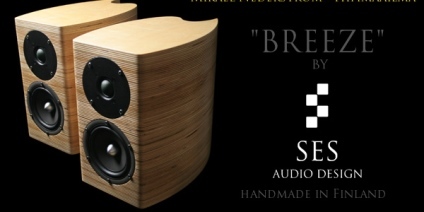 Never heard a piece of MDF sound healthier! Artome is still in the process of bettering the Exciter module’s power handling capacity and reducing the level of distortion. The cabinet of the Cinema soundboards comes either white or black painted MDF. The default color for the legs is light/dark wood (Vino) and black (Serene). There are six color options for the acoustic fabric of the front panel (black as the default).